The Restitution of Land Rights Act (No. 22 of 1994) was passed to great applause in 1994. Its goal was to offer a solution to people who had lost their land as a result of racially discriminatory practices such as forced removals. This included people who were dumped in Bantustans and put under traditional leaders. The Restitution of Land Rights Amendment Act was passed by the National Assembly and National Council of Provinces. It was signed by President Zuma on 30, June 2014. The claims lodgement period reopened on 1 July, 2014. However, concerns about the Act remain. It is crucial that we roll back the legacy of land dispossession resulting from colonialism and apartheid. But does the new Restitution of Land Rights Amendment Act (hereafter the Act) provide hope for solving these problems? The Act comes at a time when land reform and land distribution are failing. Meanwhile, millions of South Africans still lack “security of land tenure”, especially those living in rural areas and in the former Bantustans. While some protections have been put in place, these (with the exception of the Interim Protection of Informal Land Rights Act [IPILRA]) do not cover people living in communal areas. Furthermore, there are beneficiaries of the previous Restitution of Land Rights Act who have still not received their land titles as a result of opposition by traditional leaders. The Act must also be read in the context of other laws and policies, especially the Communal Land Tenure Policy and the Recapitalisation and Development Policy. In this current context, the Act is unlikely to meet the needs of rural people, and could well undermine their land rights as protected in Section 25(6) of the Constitution. Download the Restitution of Land Rights Amendment Act in PDF. The Restitution of Land Rights Amendment Bill was tabled in Parliament in October 2013. Written submissions were due on Friday, November 1st, 2013. Provincial public hearings took place during November 2013 and January 2014. Click here to see the hearings schedule. National public hearings at Parliament in Cape Town took place at the end of January 2014. The National Assembly passed the Bill on February 25th. The National Council of Provinces (NCOP) held its own public hearings – 9 of them (1 per province) – in a single week in between March 10th-14th. The NCOP passed the Bill on March 27th. President Zuma signed the Act into law on June 30th, 2014. The lodgement period for restitution claims was reopened on July 1st, 2014. People can lodge claims until June 30th, 2019. Outstanding claims: Not yet settled at all. See the Restitution Commission’s map of outstanding claims. Community: The Restitution Act says community means any group of persons whose rights in land are derived from shared rules determining access to land held in common by such group, and includes part of any such group. Explicitly allows people dispossessed under Betterment to put in restitution claims. According to Commission on Restitution of Land Rights, 20 592 claims (or 25.87 per cent of the total land claims registered with the Department) have not yet been finalised or the settlement agreement has not been fully implemented. Around 50% of the land already acquired for restitution has still not been transferred to the beneficiaries. Several claimants have been waiting for over 10 years for the implementation of their settlement agreement. The backlog of unresolved restitution claims raises concerns that claims filed in the new restitution period might further undermine the fulfilment of existing claims. Worse than that, the lodgement of new counter-claims may be used to justify the Commission and Department’s refusal to honour transfer agreements and restitution awards that they would otherwise be legally bound to honour. In light of these issues, submissions on the Restitution Act asked that the Act ring fence earlier claims by asking for court permission to handle counterclaims to the same land at the same time as claims lodged by the 1998 deadline. But the Act stops short of ring fencing. It only prioritises claims lodged before 1998. The Act says the Commission should consider the prioritisation of claims lodged by the 1998 deadline and it cannot ignore these claims or leave them to last because they are complex. BUT it does not say how the Commission should deal with prioritising claims lodged by the 1998 deadline. With the current words in the Act, if new claims are lodged on the same land as a claim submitted by 31 December 1998, the Commission can deal with the new and old claims at the same time. Therefore the Commission can decide that until they have investigated the new claim, the old claim cannot be prioritised. Therefore, the prioritisation provision in the Act does not protect prior claimants enough. In order to hold the Commission to its commitment to prioritise claims lodged prior to 1998, you should monitor the claims that are being settled to see if they are prior claims. Also, groups who are still waiting for their claims to be resolved should approach the Commission with a short written motivation on the need to prioritise its claim and ask that something be done about it within a month. Despite President Zuma saying that the Restitution Act would be amended to allow people dispossessed before 1913 to lodge a claim, these amendments never took place. The Act still states that only people who lost land as a result of racially discriminatory practices after 1913 and before 1994 can lodge a claim. The next section discusses the 1913 cut-off date. What does the 1913 cut-off date mean? 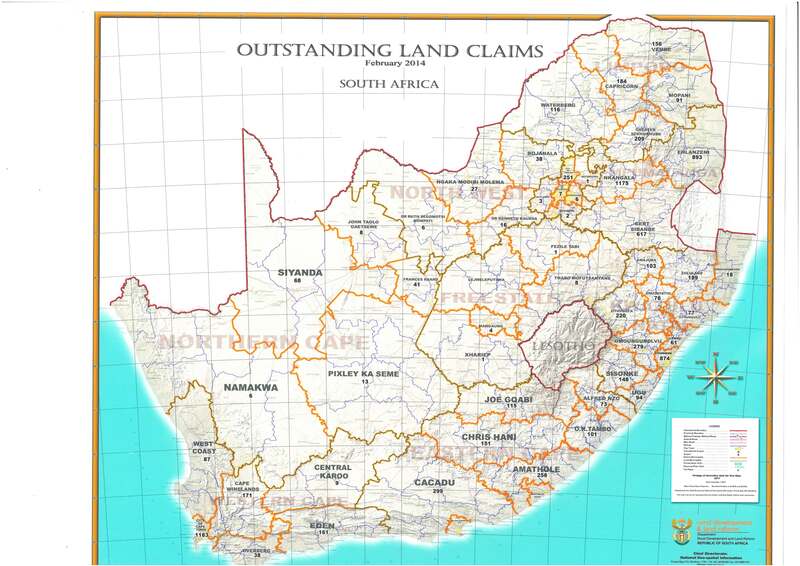 Many traditional leaders especially in KwaZulu-Natal have made it clear that they intend to lodge land claims. King Goodwill Zwelithini, together with the Ingonyama Trust, intends to lodge a claim for possibly the entire province of KwaZulu-Natal – including the Durban Metro as well as sections of the Eastern Cape, Mpumalanga and the Free State. The aim of the proposed claim on behalf of the king is to claim land taken from the Zulu kingdom during the colonial period — from 1838 onwards — first by the Voortrekkers and then the British. Indeed President Jacob Zuma has been encouraging traditional leaders to make such land claims. In his speech to the National House of Traditional Leaders earlier in 2014, he told traditional leaders to get “good lawyers” so that they could put in land claims. A direct descendant of a person who was dispossessed of a right in land after 19 June 1913 as a result of past racially discriminatory laws or practices. An administrator of the estate of a person who was dispossessed of a right in land after 19 June 1913 as a result of past racially discriminatory laws or practices. A person who was dispossessed of a right in land after 19 June 1913 as a result of past racially discriminatory laws or practices but was compensated for the loss of that right in a manner which is just and equitable in line with section 25(3) of the Constitution. Claims by traditional leaders do not take into account the complex history of KwaZulu-Natal, in which there were many different groups who have overlapping claims to land which various groups occupied at different points in time. These claims are invalid in terms of the Amendment of Land Restitution Act of 2014. The Minister of Rural Development and Land Reform, Gugile Nkwinti, has said (07/2014) that the government is going to create a policy and also possibly a law that recognises the claims to land of people dispossessed prior to 1913. This law would be separate from the Restitution Act. As things stand, this is not a law yet but a policy that is under discussion. Government officials refer to this policy as “exceptions to the 1913 cut-off date” or as the “heritage” policy. While this policy is spoken about in reference to the Khoi San, it includes other groups too. What will be the focus of the policy? 2. Allocating specific pieces of land as heritage sites and historical landmarks (it’s not clear if ownership, lease or use rights will be allocated). What qualifies as a heritage site or historical landmark? Historical landmarks: Sites of significance relating to the history of land dispossession in South Africa; Graves and burial grounds including ancestral graves, royal graves and graves of traditional leaders, graves of victims of conflict, graves of important individuals, historical graves and cemeteries; landmarks that are important to the community or the pattern of South Africa’s history; where uncommon, rare or endangered aspects of South Africa’s natural or cultural heritage are located. You may have already lodged a restitution claim prior to the end of 1998. If so, this check list is still important as it tells you what the Restitution Commission should have done/do to settle your claim. Has the Commission fulfilled all these steps? Publish a notice of the claim in the Gazette. If someone else lodges a claim on the same piece of land as your claim, the Commission must notify you. If you hear that someone has put in a claim on land you claimed, alert us. Enter upon and occupy the land under claim without the permission of the owner or lawful occupier.